We’ve spoken at length about the merits and disadvantages of the super minimal interior in the Tesla Model 3, which focuses all of the car’s information and controls on a single touchscreen. It’s hard to believe the system is road legal, and it’s something one unlucky owner caught on video trying to explain to the cops. In the video above via InsideEVs, recorded on Sept. 29, Tesla Model 3 owner Jon Hall was pulled over and questioned about the giant laptop-like touchscreen seemingly tacked onto his dashboard. When the officer first walked up, it seemed like Hall thought the cop was joking when told he was “not allowed to have your computer mounted on there,” before quickly realizing the cop serious. 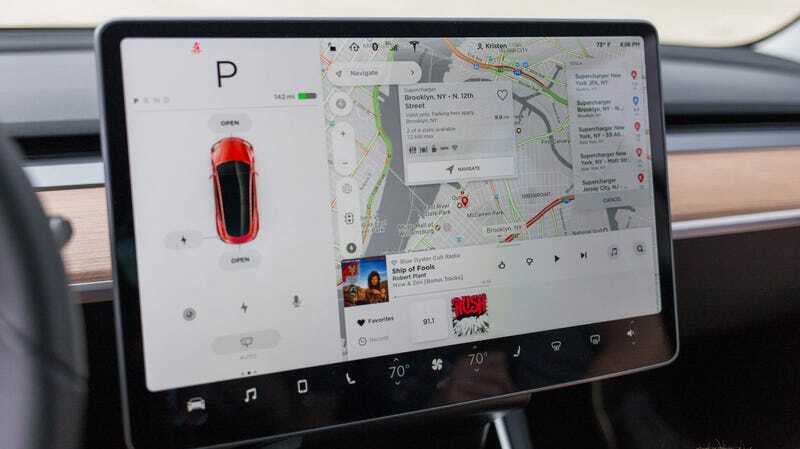 To be fair, the Model 3's screen is strikingly large, and since it’s the only prominent feature on the dashboard, it does stick out and draw attention to itself. Describing it as a computer tacked on isn’t exactly wrong. After Hall explained that the screen came stock with the car and showed the officer how the touchscreen controlled most of the car’s functions, the officer apologized, maybe a little embarrassed at his lack of tech savviness, and let Hall go. But it’s still an interesting interaction for a few reasons. Screens are getting bigger and bolder in cars and the Model 3 isn’t exactly a huge departure from that trend. And these things are probably only going to get a lot crazier as technology progresses, like the proposed screen on the upcoming Byton crossover that stretches from one door to the other inside. It’s definitely going to take some adjusting to—as a society, apparently. At least this cop didn’t pull a gun over his Tesla confusion.